I have no shortage of denim in my closet. In fact, I tend to wear denim at least three or four times a week and always have a sizable collection of jeans on rotation. While my denim tastes often change over time, lately, I’ve been a diehard fan of straight-leg silhouettes and, more recently, started wearing a leopard-print pair. Leave it to the fashion set, though, to make me ready to shake things up again with some brand-new denim trends. Over the last few days, I’ve spotted some great new jean trends on the cool fashion girls during New York Fashion Week, straight from the street style scene. As is typical of fashion-pack looks, it should come as no surprise that all of them are cool, fashion-forward, and a bit daring. Ahead, I’m breaking down the coolest new jean trends for fall, spotted on the streets of NYC, and my edit of the best pieces to wear the looks for yourself. Like many of the biggest '90s trends, cargo jeans are making a return. Style them with a puffy-sleeve top to make them feel on point for 2018. Expect to see this Balenciaga style all over Instagram. Celebs like Kaia Gerber have been snapped wearing this style from I.Am.Gia. Forty dollars to try the trend? We're in. The baggy anti–skinny jean style with wide-leg cuts is picking up steam. Baggy denim with a baggy tee? Yep. Of course Zara has the perfect affordable pair. 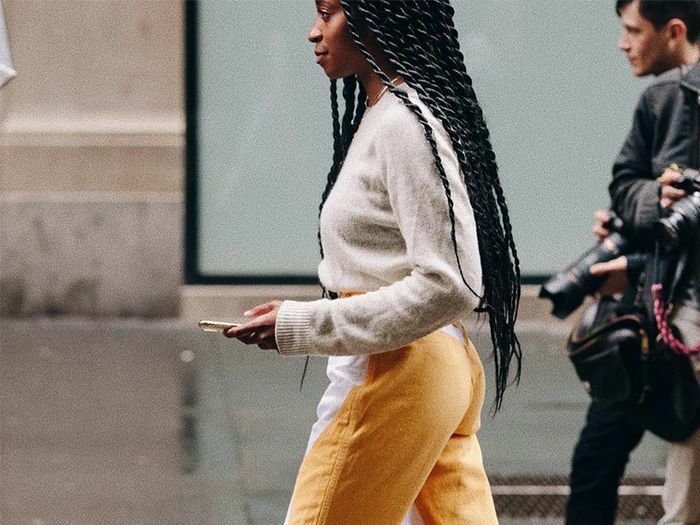 Ever since Ganni released a collection of colored jeans earlier this year, we've been seeing denim in shades across the board on our favorite fashion girls. The brand that made us fall in love with colored denim. Green is all over the street style scene. Animal prints are huge for fall, so it's no surprise that the trend is also big in the world of denim. Saint Laurent has a pair high on this editor's wish list. I've already picked up this pair and recently wore them. Leopard is bold but always in style. One of the great things about jeans with exposed stitching? They instantly look more polished and tailored. These have a cool vintage feel. Cropped and perfect to wear with tall boots. Topshop always delivers when it comes to the latest denim trends.